At the end of this course, the successful student will have a fundamental understanding of the working principles of semiconductor devices (pn-junction diode, metal-oxide-semiconductor capacitor, field-effect transistor, bipolar junction transistor) used in modern integrated circuits. One of the student outcomes of this course will be an ability to design a transistor to meet performance requirements within realistic constraints. Tsu-Jae King Liu received the B.S., M.S. and Ph.D. degrees in Electrical Engineering from Stanford University in 1984, 1986 and 1994, respectively. 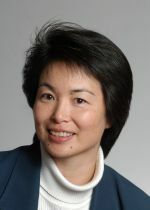 She joined the Xerox Palo Alto Research Center as a Member of Research Staff in 1992, to research and develop polycrystalline-silicon thin-film transistor technologies for high-performance flat-panel display and imaging applications. In August 1996, she joined the faculty of the University of California, at Berkeley, where she is now the Conexant Systems Distinguished Professor of Electrical Engineering and Computer Sciences (EECS) and the Associate Chair of the Department.